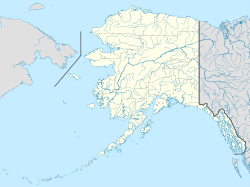 Goodnews Bay (Mamterat in Central Alaskan Yup'ik) is a city in Bethel Census Area, Alaska, United States. As of the 2010 census, the population of the city was 243,  up from 230 in 2000. Goodnews Bay is located on the north shore of Goodnews Bay at the mouth of the Goodnews River, at 59°7′17″N 161°35′9″W﻿ / ﻿59.12139°N 161.58583°W﻿ / 59.12139; -161.58583 (59.121408, -161.585835). It is 116 miles (187 km) south of Bethel, 110 miles (180 km) northwest of Dillingham and 400 miles (640 km) west of Anchorage. According to the United States Census Bureau, the city has a total area of 3.7 square miles (9.6 km2), all of it land. Goodnews Bay first reported on the 1880 U.S. Census as the unincorporated Inuit village of "Mumtrahamute" with 162 residents (all Inuit). It reported on the 1890 census as "Mumtrahamiut", again returning with an unchanged 162 residents. It next reported in 1920 as "Mumtrakmut." It next reported in 1940 as "Good News Bay." It returned in 1950 as "Mumtrak." From 1960-70, it also returned as Mumtrak with the alternative name of Goodnews Bay. It formally incorporated in 1970 as Goodnews Bay, and has returned as such since 1980. As of the census of 2000, there were 230 people, 71 households, and 47 families residing in the city. The population density was 72.6 people per square mile (28.0/km²). There were 87 housing units at an average density of 27.5 per square mile (10.6/km²). The racial makeup of the city was 5.65% White, 92.61% Native American, and 1.74% from two or more races. There were 71 households out of which 45.1% had children under the age of 18 living with them, 31.0% were married couples living together, 23.9% had a female householder with no husband present, and 32.4% were non-families. 32.4% of all households were made up of individuals and 4.2% had someone living alone who was 65 years of age or older. The average household size was 3.24 and the average family size was 4.04. In the city, the age distribution of the population shows 36.1% under the age of 18, 10.4% from 18 to 24, 28.3% from 25 to 44, 17.4% from 45 to 64, and 7.8% who were 65 years of age or older. The median age was 31 years. For every 100 females, there were 105.4 males. For every 100 females age 18 and over, there were 122.7 males. The median income for a household in the city was $16,250, and the median income for a family was $21,563. Males had a median income of $31,250 versus $0 for females. The per capita income for the city was $6,851. About 37.8% of families and 39.0% of the population were below the poverty line, including 53.3% of those under the age of eighteen and none of those sixty five or over. Lower Kuskokwim School District operates the Rocky Mountain School, a PreK-12 school. As of 2018[update] it has one of the lowest enrollments in LKSD as it has 54 students. ^ 1996 Alaska Municipal Officials Directory. Juneau: Alaska Municipal League/Alaska Department of Community and Regional Affairs. January 1996. p. 61. ^ 2015 Alaska Municipal Officials Directory. Juneau: Alaska Municipal League. 2015. p. 67. ^ a b "Geographic Identifiers: 2010 Demographic Profile Data (G001): Goodnews Bay city, Alaska". U.S. Census Bureau, American Factfinder. Retrieved September 20, 2013. ^ "Rocky Mountain School." Rocky Mountain School. Retrieved on July 13, 2018. This page was last edited on 13 July 2018, at 06:56 (UTC).